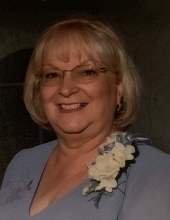 It is with great sorrow to announce that Constance (Connie) Lee McBride [Nagy], from Standish, Michigan, daughter of the late Art and Mary Jane Nagy (Brewer), unexpectedly passed away on November 2nd, 2018, at the age of 65. Constance was raised in Melita, Michigan, and lived most of her life in Standish, Michigan. She is survived by her beloved husband of 42 years, William (Bill) McBride; loving mother of sons, Benjamin (Kerri) McBride and Jonathan (Shalan) McBride and daughter, Katie (Michael) Fryske; dear sister of siblings; Peter (Kelly) Nagy, sister Amy (Andrew) Thorner, and sister-in-law Pamela Nagy; proud grandmother of grandchildren; Austin, Logan, Karleigh, Makala, Deklin, Hunter, Blake, James, and Jenna, and loving aunt to many nieces and nephews. She is preceded in death by her in-laws; Robert and Irene McBride; her brother Bryan Nagy; and her little dog Suggie. Connie is remembered as person who took care of others. Many family and friends frequently called her to ask for advice. She looked forward to relaxing at the cabin and celebrating the holidays. She enjoyed time spent with family and friends and was famous for her cheesy potatoes. She also enjoyed casino trips, shopping, and was a fan of the Detroit Tigers. Her roles as a Registered Nurse (R.N.) and a mother of three children were the primary focus of her life until she was blessed nine grandchildren. The visitation will be at the Lee- Ramsay Funeral Home - STANDISH CHAPEL on Wednesday, November 7, 2018, from 1-8 p.m., with a Vigil Service and Rosary at 6 pm. Her funeral services will be held at Resurrection of the Lord Parish Catholic Church in Standish, Michigan, on Thursday, November 8th. She will lie in state prior to an 11 a.m. service officiated by Father David. Burial will take place at Clayton Township Cemetery in Sterling, Michigan, after a luncheon following mass. Please join us to celebrate her life. To send flowers or a remembrance gift to the family of Connie L. McBride, please visit our Tribute Store. "Email Address" would like to share the life celebration of Connie L. McBride. Click on the "link" to go to share a favorite memory or leave a condolence message for the family.